The system we want can’t be delivered by the contracts we have. The pressure to move from Volume to Value was a persistent theme at the sixth annual National Association of Specialty Pharmacy (NASP) Meeting held September 24th-26th in Washington, D.C. Both the need for change that actually works and the need for industry experts to do their part to drive this change were emphasized by Newt Gingrich during his keynote session. Additionally, a call for healthcare innovation to address access to specialty medications was echoed by specialty pharmacy stakeholders throughout the three-day conference. Doug Long, VP of Industry Relations for IQVIA, presented his popular Specialty Pharmacy Trend Report on Wednesday morning. During this presentation, Long covered the growth of specialty drug spending, rising out-of-pocket expenses for patients, and the consequent growing potential for script abandonment. Long also discussed the merger of payers and pharmacy benefit managers (PBMs) such as Cigna and ESI, how they will continue to seek ways to drive patients to the lowest cost care option, and how IQVIA believes the use of value-based models will continue to increase. At AssistRx, we share the belief that the shift to value-based models is inevitable wherever outcomes can be effectively measured. 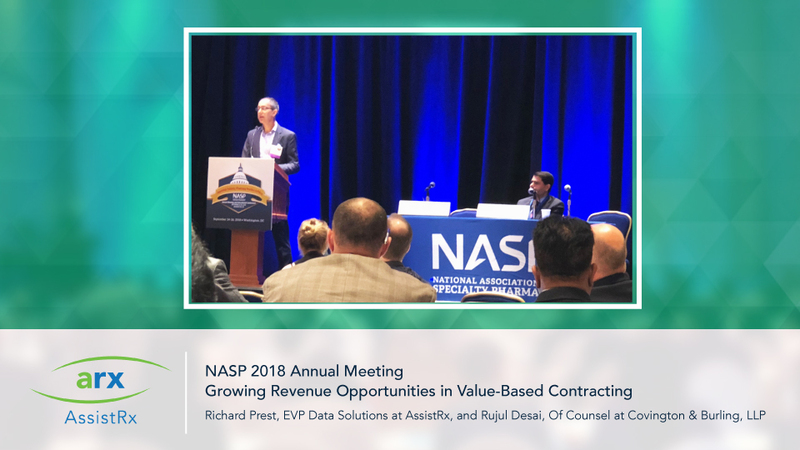 On Tuesday afternoon, Richard Prest, EVP of Data Solutions at AssistRx, and Rujul Desai, of Counsel at Covington & Burling, LLP, shared these ideas during their well-attended “Growing Revenue Opportunities in Value-Based Contracting” presentation. What is Value Based Contracting? Value Based Contracting (VBC) refers to contracts between a life science company and a plan sponsor or their PBM in which the amount paid is adjusted based on the measured outcomes (as a proxy for value) provided by the life science company’s therapy. VBC is certainly not new to the industry, and the session covered various VBC programs implemented in the EU and the U.S. Among these programs, life science companies have benefited from the ability to negotiate a formulary position and net price related to the value of improved outcomes, rather than being subject to ever escalating competition-driven rebates. Payers have benefited from reduced financial exposure should expected outcomes not be achieved. Due to the pressures for adoption, the industry is already resolving many of the initial legal and regulatory challenges to VBC. That said, for many products, it will be difficult to measure outcomes. In some cases, payers and life science companies will not always be able to negotiate an acceptable VBC. We believe the shift to VBC is inevitable and that value-based contracts will be more common than not within the next decade. Life science companies can choose whether to engage in VBC and have a say in how terms are developed, or run the risk of having others make those decisions for them. Learn more about AssistRx solutions and how they can meet your needs here.